These seals have slip-on flanges for ease of installation and alignment. The extension body is designed to fit into 3” or 4” Schedule 40 pipe. Extension lengths of 2”, 3”, 4”, 6”, and 8” are available. Other lengths and diameters are available on special request. The SCE model diaphragms are TIG welded to the extension. The metal seal body and diaphragms are available in 316L low carbon stainless steel or HASTELLOY® C276. 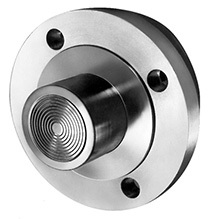 The slip on flange design simplifies installation and alignment of bolt holes. Standard flanges are zinc plated carbon steel. Other materials are available on special request. SCE series seals are furnished with Class 150, 300, or 600 ANSI standard flanges. Operating pressure is limited to the ANSI flange pressure and temperature ratings.